U.S. 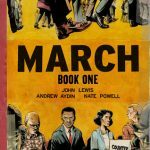 Congressman John Lewis from Georgia was having a meeting with his 2008 re-election committee, when staff member, Andrew Aydin, mentioned he was on his way to a comic book convention. When other committee members teased Aydin, Lewis remembered that in 1958, at 18, he’d read the comic “The Montgomery Story,” about Martin Luther King Jr. and his nonviolent movement. This had inspired John Lewis to nonviolent action. He used the comic as the model to organize his first sit-ins. 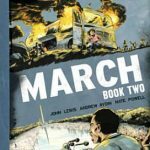 Not terribly long after that 2008 meeting, Aydin convinced Congressman Lewis to write the “March” trilogy. Book One tells of Lewis’s origins as a sharecropper’s son from Georgia and the lunch counter sit-ins of 1959 and 1960. (I reviewed it in January of 2014). Book Two covers the sit-ins and the Freedom Riders. 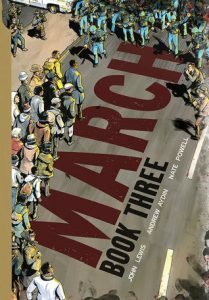 “March: Book Three” (Top Shelf Production 2016) by John Lewis and Andrew Aydin, and illustrated by Nate Powell is the final volume of the graphic novel trilogy. And the National Book Award Winner for Young Readers of 2016. It spotlights the bombing of the 16th Street Baptist Church in Birmingham, AL; Freedom Summer, the 1964 Democratic National Convention, as well as the Selma to Montgomery marches. Everyone should read this nonfiction trilogy of graphic novels. As the president of Student Nonviolent Coordinating Committee (SNCC) and a board member of Martin Luther King’s Southern Christian Leadership Conference (SCLC), young John Lewis was a pivotal figure in the Civil Rights Movement of the early sixties. He illuminates the tensions and factions within the movement. We’re introduced to Fannie Lou Hamer, Malcolm X, and of course Martin Luther King Jr. and many others. We see these historic figures as three dimensional, emotional beings in both the text and the wonderfully-wrought black and white wash drawings. We see Fannie Lou Hamer, the woman from Mississippi, who co-founded the Mississippi Freedom Democratic Party, in her unsuccessful attempt to be seated as a black Mississippi delegate for the presidential election of 1964. To that purpose she is depicted in a televised appearance addressing the Democratic National Convention’s Credentials Committee, which presidential candidate Lyndon B. Johnson interrupts with his own press conference in order to distract viewers and voters from the rift in the party. The book is not altogether clear on that, but like any nonfiction book, the reader can look up information to clarify and find out more. Getting books like this one into the hands of young adults might help keep us from backsliding into a darker more contentious history in the upcoming years. Let’s not allow history to repeat itself.